THE MED Ocean View Restaurant features New American cuisine for breakfast and lunch, with an emphasis on seafood at dinner. Seasonal menu enhancements ensure that the finest ingredients are sourced and served. THE MED dining room features oak floors, wrought iron chandeliers, panoramic view windows, and is framed by a Spanish tile fireplace. An alfresco covered terrace and sunny courtyard patio combine California's signature weather with great dining. La Sala Lounge supports THE MED with classic libations and an elegant lounge menu. 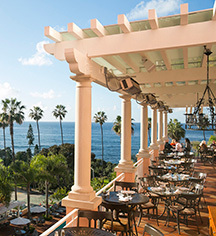 The lounge provides live entertainment and spectacular views of La Jolla Cove. Café la Rue features Modern European cuisine in a casual bistro setting. Early morning continental fare make way for a fun and creative all day dining menu until late night. 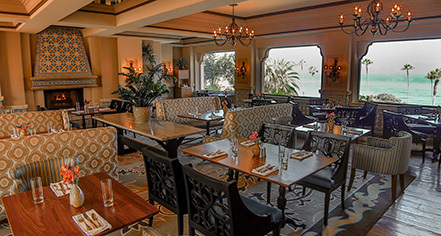 With daily happy hour and special events, Café la Rue is the La Jolla locals’ favorite. In-room private dining encourages guest to dine in the privacy of their room, suite, or villa and features special fare from the kitchens of THE MED.